Krob landscape in Mobile, AL is your go-to for all of your Landscape Services and is the landscaper you want to transform your space into a foliage oasis. We at Krob Landscape have a niche for turning any area into a landscape paradise and specialize in landscape services such as landscape design, landscape ideas, pool landscaping and Landscape Maintenance. But it doesn’t end there. Krob is equipped to handle any type of commercial and residential landscape service and Landscape Installation in Mobile, Alabama. 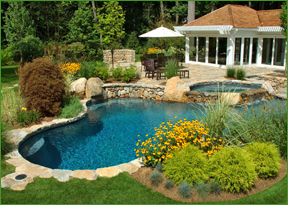 Krob employs the most highly experienced and skilled landscape designers in the industry. The Krob landscape service team will help make your ideas a reality with the latest technology and equipment in the landscape service industry. Call Krob Landscaping today to book your landscape consultation. Also check Krob out on Facebook to see what all they can do to transform your area into a foliage paradise. Call Krob Landscape for all of your landscaping services. Let our experienced landscapers draw up your landscape plans, whether it be for your backyard patio ideas, front yard landscaping ideas or garden design, we at Krob Landscape take pride in our Landscape Designs.